If you want to start an online jeans store then you have to check the Denim Story Opencart Theme. It was developed for jeans stores, fashion stores, and clothing shops and includes all necessary features. 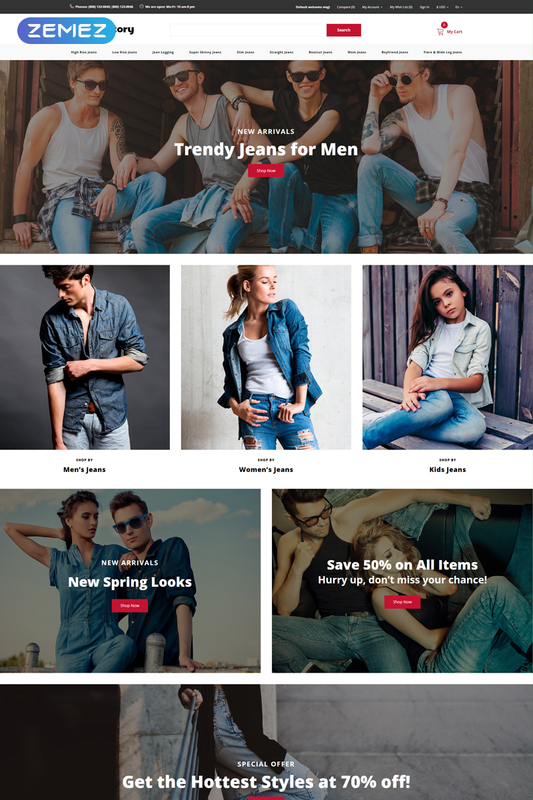 Developed as e-commerce website theme Denim Store includes full OpenCart plugin lack and provides you with cart, wishlist, and compare buttons. Moreover, it has currency options and language options and you can use them to find new customers from other countries. Denim Story looks eye-catchy and allows you to highlight your products due to clean design and visual effects. With this theme, you can blog about the latest news and new arrivals. You can also use social options to advertise your business and share information with clients. With Denim Story you can develop a fully functional online store and provide customers with jeans, footwear, sportswear, and fashion accessories.